In preparation for episode 11 of our Horde for Life podcast in which we are profiling the top 6 “Tier Sets” in the World of Warcraft, I revisited many gear sets and their associated, incredible artwork that had escaped my memory. During the time of this research and review I had several conversations with friends, guild mates and even total strangers about all of these long forgotten gear sets and was amazed at the sheer amount of people who, due to their relatively new introduction to the game, really have no fundamental knowledge of these in-game relics and many relayed that they have never even laid eyes on the sets. This lack of familiarity with the past work of those wonderful Blizzard artists is in my opinion, one of the most glaring gaps – a chasm in fact – that the combination of a tiered system of gear progression and a lack of a wardrobe feature/appearance tab creates. Knowing that something approaching one half of the games population have never even laid eyes (more less their virtual hands) on this now needlessly obsolete gear is borderline unforgivable. This is only further exacerbated by the fact that correcting this flaw is so easily attained, yet seemingly ignored. It was this revelation, knowing that many players have not even been exposed to what diversity would actually bring with it that has me authoring this article on the 30 days of diversity. I have decided that my quest, my crusade to bring more end game diversity into our beloved game should work harder to include exposure of the obsolete riches that lie just beneath the Azerothian surface. Everyone should have the pleasure of reviewing again or for the first time, all of these wonderful art assets. To that end, we will count down and profile over the next 30 days, the top 30 tier sets of expansions and patches past. Obsolete gear that Blizzard could in a single patch cycle make relevant again. I challenge each and every player in the World of Warcraft to review these images and tell me your game experience would not be greatly enhanced by their viability via an appearance tab. 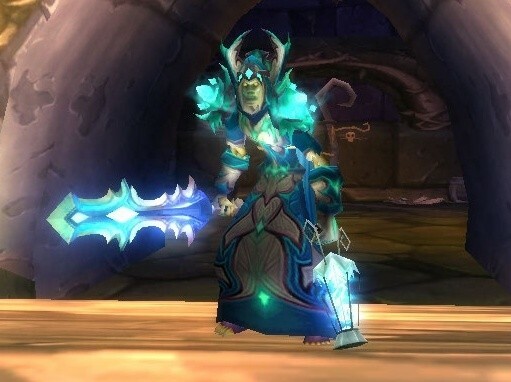 In addition to this set looking infinitely cool, its distinct color palette would be a perfect complement to Frost mages and turn heads everywhere. Like many tier sets of old, not only is this set utterly obsolete and unusable in today’s ever compartmentalized tier 11 world, this set is no longer even in-game, obsolete or not. That’s right, this epic looking gear is collecting proverbial cobwebs, “deactivated” in Blizzard’s Oracle database. In effect the Frostfire set is indefinitely “on ice”… but why? No longer in game, the Frostfire Tier set is "on ice"
This entry was posted on May 4, 2011 at 11:05 pm and is filed under General, MMO, Role Playing, World of Warcraft. You can follow any responses to this entry through the RSS 2.0 feed. You can leave a response, or trackback from your own site. I am in complete support of your crusade for a wardrobe feature. Almost Immediately after I started playing WoW (in early “Vanilla”), I was trying on the grey clothing items and sometimes wearing them out-of-combat based on their looks alone. The cloth and leather “grays” especially were often not just aesthetically pleasing, but more in keeping with characters and situations, at least from a role playing perspective. Even my “weapon” of choice was a shovel I had picked up among the mining Kobolds near Goldshire! Now while I realize that most folks playing WoW aren’t role playing to such an extent, I’m willing to bet that most do want their characters to look appealing to them. However one defines it, one almost certainly feels an affinity for one’s avatar and has ideas on how it should look. And the sheer amount of diverse clothing and even equipable item options in game should provide for any type of “look” that can be imagined. To this end, I have been looking at every equitable “grey” I run across. It came to me (long time ago) that these items are cheap, usually none-binding, and of course are inexpensive. Building a demand for certain pieces does have an effect on prices, and some are hard to find. But I have never seen “greys” selling for the same prices as “greens”, with the exception of a few really fun/goofy and hard to get pieces. I’ve been debating the merits of starting a site or data base for these items geared towards role players. If the wardrobe feature was to be implemented by Blizzard, it would probably have a much wider appeal. I’m not the most tech savvy person on the interwebs, so I’m still kicking the idea around. Meantime, your idea to refresh people’s memories, and introduce those who came to WoW at some later date is terrific! I’ll be keeping track and reminiscing along with you. I am willing to bet I find a few sets I have not seen myself.